We begin the show with an interview with Dr. Heather Ann Thompson about her book Blood in the Water: the Attica Prison uprising of 1971 and its Legacy. Dr. Thompson is Professor of History in the Department of Afro-American and African Studies, Residential College, and Department of History at the University of Michigan. 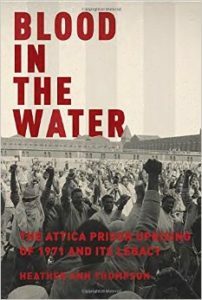 Dr. Heather Ann Thompson will discuss her book Blood in the Water: the Attica Prison uprising of 1971 on Wednesday September 14, 7:30 PM at Red Emma’s.